I will comment just generally on these three bands... having not heard any of the albums. 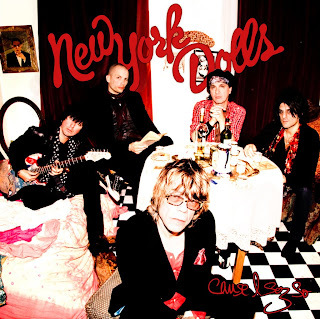 New York Dolls... new album? Really??? Wow. I would be curious. 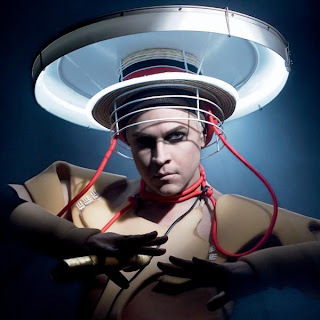 Fischerspooner, I loved you for a minute. Then I saw you live and was so terribly disappointed. You played your big "hit song" twice and that is so lame. And, I was promised by all my friends a big "art performance spectacular" and yet all you did was have on some feathers and fake blood and you lip-synched. It was very lame. Also, I don't even know if you've done anything since that first album and that was ages ago. Would be curious to see if you've grown with the time. Peaches, I still love you in a way. But you've gotten redundant. And, again, your last live show was crap. What happened? The first three or four times I saw you, you were crazy and awesome and wild and had crazy things. Then, you just were there. And it was lame. And it was expensive and short and disappointing. Sad. This is an interesting pairing of artists for the reason you just raised -- of this group I've only seen the Dolls live, but I've heard that the other two aren't the best in that department. I feel the Dolls are better in person than on record, and Fischerspooner and Peaches seem to be the opposite. In fact, I've heard so many comments like the one you made that I would probably never see the other two unless the opportunity really presented itself. I'm just content to listen to their albums, whereas I might skip buying the new Dolls record and I'd buy tickets to the see their next gig without hesitation. The New York Dolls I was familiar with but really introduced to by a very close friend. I loved the two records they released in the 70s and thought Thunders' solo work was cool too. David Johansen's 80s samba music and acting career was weak as hell, but every artist is entitled to through a tough time, and the 80s were hell on a LOT of people. So that's my TOTALLY unopinionated take on their past, and as for their present and future I'm pleased and impressed. I thought their recent album was good- not amazing but headed in the right direction. Peaches I don't care about. I don't really find the idea of dumbing down music and its accompanying public performance kitsch, and its just too self-indulgent to give it the benefit of the doubt and call it Dada-esque. Fischerspooner can rightfully receive a portion of criticism for this too, but to a much lesser extent. Fischerspooner's first album was catchy minimalistic synth pop, and frankly it was just good. I didn't care much for their second record; it seemed like it was trying a little too hard to diversify with out heading in any one cohesive direction. I'm regaining hope from what I've heard of the new record... they've already outlived Electroclash... so let's wait and see how this new one pans out before rushing to judgement.